Ectropion is the medical term used to characterize sagging and outward turning of the lower eyelid and eyelashes. During blinking, the eyelids normally sweep across the surface of the cornea (Tearing occurs because the eyelids are not able to wipe the surface of the cornea well to pump the tears into the tear duct. 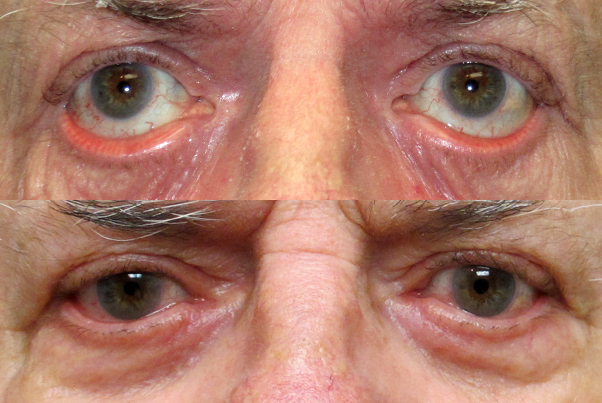 Most cases of entropion are due to relaxation of the tissues of the eyelid as a result of aging. Some cases result from scarring of the eyelid caused by chemical and thermal burns, trauma, skin cancers, or previous eyelid surgery. Rarely Ectropion can be present at birth if the eyelids do not form well.